Hiob Ludolf, Historia Aethiopica (Frankfurt, 1681). 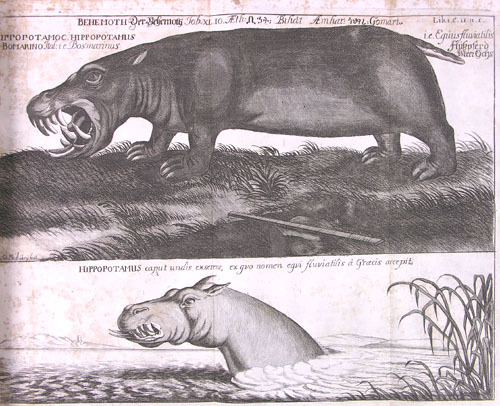 The land of Ethiopia had long fascinated Europeans, not merely as an exotic and foreign land full of strange beasts, as evidenced by the incredibly ferocious looking hippo portrayed in this volume (first image below), but also as an ancient and independent Christian empire beyond the realms of Islam which hemmed them in. It had adopted Christianity in the 4th century A.D. but had been cut off from Western Europe by the spread of Islam across northern Africa and the Middle East. In the Middle Ages the myth of Prester John, a powerful Christian prince and potential ally against the Muslim world, grew in the minds of Europeans, and when contacts were re-established with Ethiopia in the 15th century it seemed to fit the bill. When the Portuguese sent military aid, to counter Islamic threats to their trading interests in the region in the 16th century, Jesuit missionaries followed them. They became so influential at court that they converted the Emperor and became a threat to the native Monophysite church, leading to their expulsion in 1632. 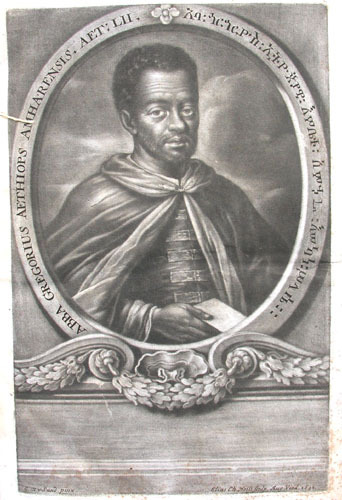 The second image below (from a supplementary volume published in 1691) is a portrait of Gorgoryos Abba, the Ethiopian scholar who taught the author, Hiob Ludolf (1624-1704) Amharic after meeting him in Italy. Ludolf went on to publish the first Amharic grammar. Here Gorgoryos is surrounded by a border bearing inscriptions in Latin and Amharic. Presented by the author to the orientalist Edmund Castell.